Strong demand for high-margin Panamera versions is helping Porsche recover. BERLIN (Bloomberg) -- Porsche Automobil Holding SE improved its full-year forecast after the carmaking division's sales beat analysts' estimates as the new Panamera sedan attracted buyers. The loss for the year ending July 31 will be less than 1 billion euros ($1.2 billion), the maker of the 911 sports car said today in a statement. That compares with a “low single-digit” billion-euro loss forecast on March 17. Nine-month sales by the car-manufacturing unit rose 12 percent to 5.2 billion euros, while the operating profit was 600 million euros. The company, which took a majority stake in Volkswagen AG in January 2009, posted its first net loss since 1994 last year because of writedowns on the value of options on shares of Europe's biggest carmaker following a failed hostile takeover. Volkswagen turned around and acquired 49.9 percent of Stuttgart-based Porsche's carmaking business in December. Porsche rose as much as 1.04 euros, or 3 percent, to 35.64 euros and was up 2.1 percent as of 11:58 CET in Frankfurt trading, valuing the carmaker at 6.2 billion euros. Nine-month deliveries declined 0.1 percent from a year earlier to 53,605 cars and SUVs, Porsche said. The company sold 13,906 Panameras in the period. The model, Porsche's latest and its first car with four doors, cost 1 billion euros to develop and went on sale in Germany last September. 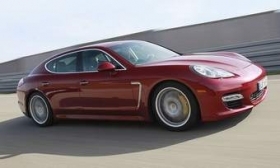 Porsche has a fiscal-2010 target of selling 20,000 Panameras, which has a start price of 75,899 euros in Germany. “The Panamera is proving a major asset for Porsche in difficult times,” said Frank Biller, a Stuttgart-based analyst with Landesbank Baden-Wuerttemberg who recommends buying the carmaker's stock. Deliveries of the 911 plunged 35 percent to 13,137 cars and Cayenne sales fell 23 percent to 18,932 SUVs. The carmaker is sticking to a plan for full-year deliveries to beat the 75,238 vehicles sold last year as a new version of the Cayenne, Porsche's best-selling model, and a six-cylinder Panamera reach showrooms, according to Albrecht Bamler, a spokesman. Porsche aims to double annual sales to as many as 150,000 vehicles over the medium term, benefiting from savings from the combination with VW. The after-tax loss for the nine months through April 30 was about 700 million euros, compared with profit of 4.2 billion euros a year earlier, Porsche said. Net debt as of April 30 fell to 6 billion euros from 6.1 billion euros on Jan. 31, Porsche said. The figure was reduced because of cash received when VW paid 3.9 billion euros for a 49.9 percent stake in the Porsche AG carmaking unit as part of the merger due to be completed by 2011, it said. Porsche owns 50.7 percent of Volkswagen's ordinary shares. The company is planning a capital increase of about 5 billion euros in the first half of 2011. The manufacturer reiterated today that it's seeking a minimum 2.5 billion euros in the first phase as the controlling Porsche and Piech families, who hold all of the common stock that carries voting rights, buy the new shares.